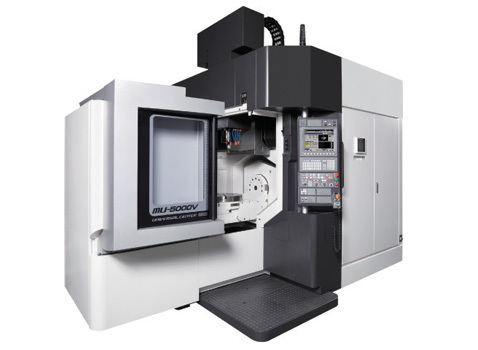 The MU-5000V 5-axis vertical machining center achieves high production capabilities in 5-axis, multi-sided machining. This CNC vertical machining center enables heavy duty cutting and high speed finishing with a highly rigid and precise double column structure and low center of gravity in workpiece movement (trunnion table). The efficient and accurate trunnion table means quality positioning for simultaneous 5-axis cutting. The MU-5000V can easily be adapted for use with APC, multiple ATC, automation or FMS without compromising operability because this expansion takes place at the back of the machine. Built on Okuma’s Thermo-Friendly structure, this machine will perform consistently from the first part to the last, regardless of warmup time or ambient temperature. The MU-5000V was honored in Nikkan Kogyo Shimbun’s (Business & Technology Daily News) 55th (2012) Best 10 New Product Awards.